Scrivener can be thought of as an idea manager, although it’s designed for writers and provides most of the common features of a text editor. Its main value, however, comes from the way it handles lots (and lots) of fragments — this makes it indispensable for large or complex writing projects. A Scrivener document is structured as a hierarchy of text blocks, which (a little confusingly) are called “documents.” If you think of your main project as a manuscript, or a book, then a “document” might be a chapter, a section containing chapters, a paragraph, or any kind of half-formed preliminary scrap you’ve started to write. Since a “document” can be empty, you can also plan out or outline your project with any number of levels of organization, and then fill in the content as it comes to mind. The Scrivener interface comprises mainly a hierarchical view of all the docs in your manuscript (they call it the Binder), with a formattable text editing area on the right. Additional info may be optionally displayed in a third column farther to the right. A separate section in the hierarchy is for “research,” although you might use it for anything. This section has the unique ability (not shared with other top-level objects) of storing non-text items, such as PDF documents, web pages (active or snapshots), audio or video clips, etc. The idea is to provide a hierarchical way to centralize all those clips and references that pile up while the writing is getting started. The Binder (navigator) on the left and the manuscript info column on the right can be turned off with the buttons at the far left and right of the toolbar. Scrivener provides a variety of ways to organize and manage your material, including various tags and comments assigned to any of your manuscript’s docs. Each feature has an “original intent,” but that’s only the developer’s suggestion. In practice, the hope is that users will abuse and re-use all these features to fit Scrivener to their own work flow. The biggest surprise in Scrivener is also one of its most powerful features, which they call “compiling” your manuscript. The intent of Scrivener’s editing window is emphatically not to format your document, although all the usual rich text formatting controls are provided. Instead, Scrivener has an output module that can generate finished text documents ready for printing, and whatever formatting you do in the edit window is for your eyes only — whether you set up fancy headings, blue sections of rough text, huge fonts for readability, etc. When you’re ready to show the manuscript to someone else, you tell Scrivener what kind of layout you want (typewriter style, typeset in your favorite font, PDF, plain text, etc.) and also which sections you want included (e.g., omit the copyright page; include special pages for editors, agents, or reviewers; just print chapters 2-4; etc.). I should clarify that embedded formatting (italics and bold) is not stripped when the output document is generated, but all the paragraph-level formatting in the edit window will be ignored. This sounds strange, but the compiler setup allows for tremendous flexibility in automatically re-formatting for specific purposes, so you end up with one master document that can take many visual forms for different situations. It can take some weeks of use to get familiar with Scrivener’s deeper features, but it’s well worth the effort. In the meantime, using it as a hierarchical writing tool, without worrying about advanced capabilities, more than justifies its incredibly reasonable price. 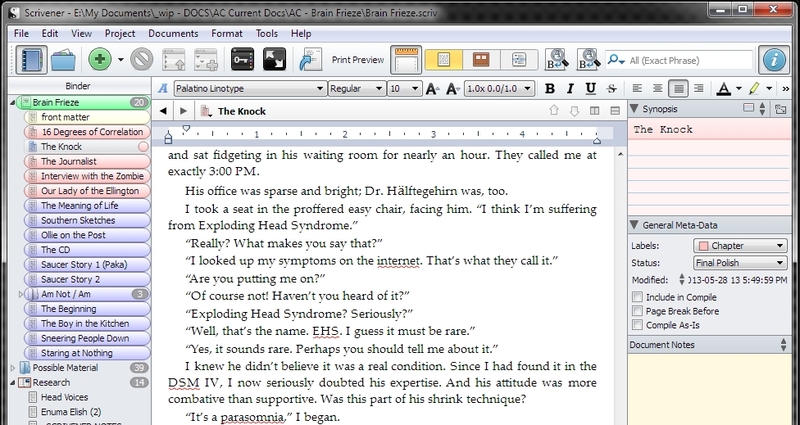 You can find out all about Scrivener at http://www.literatureandlatte.com/scrivener.php.